Group I (filled): Monday June 11 & Thursday June 14, 2012. Group II (filled): Monday June 18 & Thursday June 21, 2012. Both Groups: 9:00 AM - 1:00 PM, Integrated Sciences Building 321. Eric Martz, Ph.D.: Lead Instructor. principal author of FirstGlance in Jmol, MolviZ.Org and team member of Proteopedia.Org. Objectives: Participants will use highly user-friendly software for visual investigation of 3D molecular structures of proteins, nucleic acids, and their interactions with each other and with ligands, substrates, and drugs; and of protein evolutionary conservation. Hands-on experience will be largely with molecules of each participant's choosing. Participants will learn how to create publication-quality molecular images, rotating molecules in Powerpoint slides, and custom interactive molecular scenes on-line in Jmol. Software: All software in this course is free, genuinely user-friendly, and works on Windows, Mac OS X, or linux. Level & Pace: This workshop is designed for faculty, postdocs, research staff and graduate students familiar with basic biochemistry, but with no previous molecular visualization software experience. It progresses rapidly to powerful tools that will be of interest to specialists in protein structure and bioinformatics. Experienced participants are encouraged to work at their own speed, ahead of the group -- there is plenty of power to discover within these tools! If you do not see a rotating molecule, raise your hand to get help with java. Take a look around Proteopedia. Try searching for one of your favorite molecules. Proteopedia.Org Part I: The best place to begin understanding any macromolecule's structure. 1d66 Gal4 transcriptional regulator bound to DNA. Proteopedia.Org: The best place to start exploring any macromolecule! Main Page: green links change the molecular scene. Shows, in Jmol, all published macromolecular structures. Yep, the entire Protein Data Bank! >81,000 models. Title, Abstract and Journal Citation for each structure. Resolution in Ångstroms: (see below). Identifies functional groups of amino acids by evolutionarily conservation. Save any page for off-line projection. Explanations of structural biology terms and concepts, e.g. asymmetric unit, Protein Data Bank, hydrogen bonds, temperature value, etc. all at About Macromolecular Structure. 88% of models in the PDB come from X-ray crystallography experiments. X-ray crystallography produces an electron density map (EDM). 1.2 Å Excellent -- backbone and most sidechains very clear. Some hydrogens resolved. 2.5 Å Good -- backbone and many sidechains clear. 3.5 Å OK -- backbone and bulky sidechains mostly clear. 5.0 Å Poor -- backbone mostly clear; sidechains not clear. The Free R is the most useful single parameter for assessing overall reliability of a crystallographic model. Local uncertainty (per atom) can be displayed as temperature value (under More Views.. in FirstGlance in Jmol). See also Quality Assessment for Molecular Models. Each participant should find a molecule of personal interest. Use the sequence of your protein to search for 3D structures. Write down the PDB code(s)! At pdb.org, click Advanced Search. Choose the Query type "Sequence Features: Sequence". Paste your sequence in the large box and click Submit Query. Powerful but sometimes difficult to use; help is sometimes inadequate. Offers the most detailed information about hits. PDBsum Useful short summaries of hits. OCA Powerful and straightforward. Useful results table. Not for sequence searching, but sometimes useful. At the main page of pdb.org, use the one-slot search. Quick for text searching. Proteopedia.Org. One-slot search (no advanced search). See Help:Searching. Can't find an empirical 3D model for your sequence? Use the sequence of your protein to search the Structural Genomics Target Database for crystal structures nearing publication. 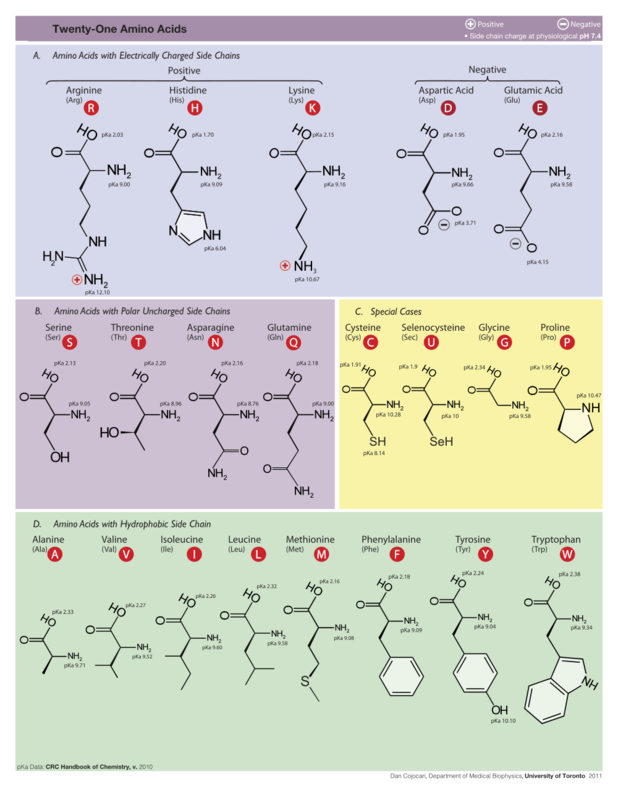 Browsing Molecules: Good places for students to choose molecules for class assignments. Topic Pages or What's New at Proteopedia. Nobel Prize in Chemistry, 2009 -- The Ribosome: in Proteopedia. See also Wayne Decatur's 3D Ribosomal Modification Maps. Quick comparisons with other programs you've heard about. We'll skip this section. It is here for reference. Nothing to install except java, works in all popular browsers, Windows, Mac OS X, or linux. Free, open source (user community "owns" it), actively developed. FirstGlance in Jmol (firstglance.jmol.org) is a user interface, or "wrapper". FirstGlance in Jmol designed for journals (used by Nature and others), very easy to use, has limited set of "canned" views. FirstGlance is much easier to use than is Jmol by itself, for example under Display Options at the Protein Data Bank. Best thing for proteins since 2004. Jmol.Org Sites Using Jmol (growing rapidly!) How to Use Jmol By Itself. Review of Protein Chemistry and Structure. We'll do this quickly. The links are for participants who are educators. Codon = 3 nucleotides; 4 nucleotides3 = 64 codons. 3 letter and 1 letter codes. Ramachandran Plots: MolProbity, Side-by-side, In Jmol/Proteopedia. Typical hydrogen bond within a protein: hydrogen donor atom is covalently bonded to hydrogen; acceptor atom is not. In proteins, donor-acceptor distance can be 2.5 to 3.5 Å. Four Levels of Protein Structure, an interactive, discovery-based tutorial with built-in reporting and assessment, which is part of Molecular Workbench from the Concord Consortium. Protein folds cannot be reliably predicted from sequence alone (using ab initio theory). Glycolytic enzyme enolase (4enl): evolutionary conservation and variability from ConSurf. More..
4enl (enolase), and 1qdq (cathepsin B, noting the conserved surface Gly, Pro -- Why?). ConSurf's Mechanism: Simplified; Details; Technical. Note the Caveats in Proteopedia's Evolutionary Conservation. Pre-calculated for every chain in the PDB. Results are shown in Proteopedia. Multiple Sequence Alignments typically include proteins of more than one function, so some conservation may be hidden. Set up each job by hand. Easily select sequences for a single protein function, revealing conservation (within a family of proteins performing a single function) that may be hidden in ConSurfDB. Do a conservation analysis limited to proteins of a single function. Here are instructions in Proteopedia. You may also wish to check the range of protein functions included in the ConSurfDB result. Notice that FirstGlance does not show the name of the molecule or its resolution, nor does it give full names of ligands etc. This is because it was designed to supplement a journal article, or a Proteopedia page that already provided such information. Contacts (1vot): Anti-Alzheimer's drug analog (*) interaction with acetylcholinesterase (Dvir et al./Sussman, 2002). Color by uncertainty: Thermal vs. static disorder (" temperature"). Biological Assemblies: Key Resources (Probable Quaternary Structure): Specific Oligomers/Biological Units (Example: 1a4f). 1BKX: Non-standard residues in Proteopedia vs. FirstGlance (under More Views). Educators: You are welcome to use the slides linked below, or to adapt content from them into your own slides. What are 3D structure data? Where do 3D structure data come from? What are the primary and derived 3D structure databases? 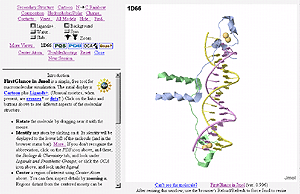 Its a wiki: you or your students can add pages or customized molecular scenes in Jmol. Great for journal supplementary materials or research group websites as well as molecular structure tutorials and student reports. Protect your pages from being changed by anyone else, e.g. Nucleosomes (protected). An easy Scene Authoring Tool attaches your customized views to Green links. This is, by far, the easiest place to create molecular tutorials, e.g. Nucleosomes (publically editable). Sandboxes (enough for your entire class!) allow students to try authoring temporary molecular scenes -- without individual accounts. Screenshots can document student work. See Teaching Strategies Using Proteopedia. PowerPoint-Ready Animation from Polyview-3D. Click on the image for a larger view and explanation. Make Animated PowerPoint Slides and Publication-Quality Images easily with Polyview-3D. Just fill out an easy form, submit it, and (shortly) voila! Center and orient the molecule as you wish. Coloring can be customized. Highlight residues that you specify. Accepts PDB files obtained from ConSurf to color your figures or slides by evolutionary conservation. Windows Powerpoint: Simply drag the animation directly from the Polyview-3D web page and drop it into a powerpoint slide. Save the image to the Desktop. Drag the image file (filename ending in .gif) from the Desktop and drop it into a Powerpoint slide. The animation will run only when the slide is projected. We won't have time to go through the following resources in detail, so the links and information below are provided mostly for you to use, if you wish, after the workshop. Orientations of Proteins in Membranes. Compare with this theoretical model of a gramicidin channel in a phosphatidyl ethanolamine bilayer. Adds hydrogen atoms and does "all atom contact analysis". Flips asparagine, glutamine, and histidine side chains where it reduces atomic clashes. Provides a clash score to compare with other models of similar resolution. Generates an interactive Ramachandran plot. You can download the PDB file with hydrogens and flips. 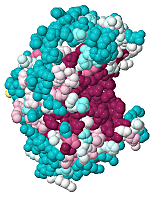 Interactive 3D Complements in Proteopedia: "Supplementary Materials"
Example Interactive 3D Figure from Biochemical Journal, 2010. HighSchool.MolviZ.Org: Resources for High School Teachers. BioMolecular Explorer 3D: Molecules for High School. Molecular Workbench (from Concord Consortium): Activities for High School Students with built-in assessment and reporting. Teaching Scenes, Tutorials, and Educators' Pages in Proteopedia, including Molecule of the Month. MolviZ.Org: Martz Central: Resources for High School, College, and Researchers. If this image is not moving, reload the page! Morph of the lactose repressor bending DNA as it recognizes the operon. More..
Includes Tutorials, K-12 Resources, Spanish Resources, and many more. 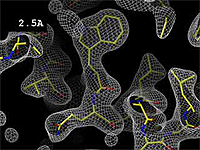 Animations / Morphs: Conformational Changes (see MOVIE at right). Text "details" remain hidden during lecture projections. Sliders zoom and slab the molecular view. See all these in the Demonstration Tutorial. Structural Alignment of two or more chains or molecules, and how to view the alignment. DeepView can align macromolecules (one or more than one chains), selecting any subset of atoms for the alignment (other atoms following), and retaining hetero atoms. The results can be saved as a PDB file, but will need manual editing to separate models with MODEL [N] and ENDMDL records so that Jmol can distinguish the models. Gale Rhodes provides a DeepView tutorial: click on the section Comparing Proteins. See also Structural Alignment Tools. Try making a comparative/homology model. Submit your sequence to Swiss-Model	. Use Automated Mode. Theoretical Models -- Introduction to Homology Modeling. Compare homology models from various methods at LOMETS. Here is an example study comparing multiple homology models. See especially comparisions in supplementary figures S4-S6. Homology models are, at best, accurate only for the main chain (not sidechains), so their uses are limited. See this example.